Northern (Arctic) Federal University named after M.V. 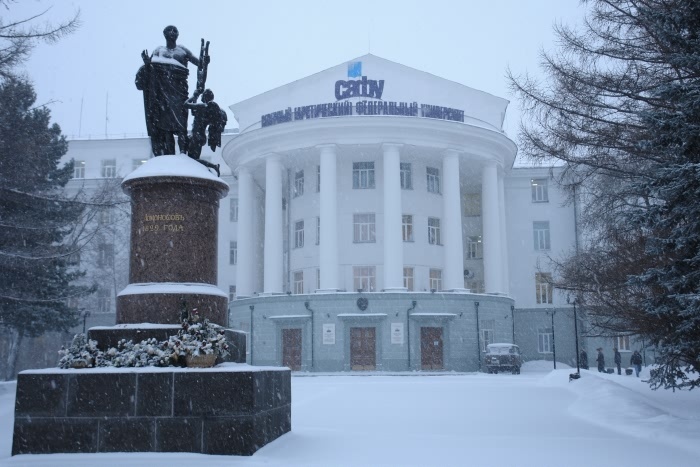 Lomonosov, located in Arkhangelsk, is one of the North-West Russia’s largest research and training center, a member of the Magna Charta Universitatum, Association of Russian leading Universities and Eurasian University Association. Being one of Russia’s 10 federal universities, NArFU fosters innovation and trains specialists for the Arctic and High North resource development. NArFU is the only Russian university being tasked with training experts of international level in areas such as engineering, technology, IT, humanities and life sciences with a special focus on the Arctic region. NArFU provides international students with high- quality education, academic mobility programs, international projects and internships, advanced research infrastructure and great opportunities for social life activities. NArFU graduates are employed at the largest Russian and international companies specializing in offshore oil and gas projects, shipbuilding, construction, energy, timber processing, environmental protection and IT. The University also has long-standing academic traditions in training specialists in linguistics, intercultural communication, journalism, law, international relations, psychology and pedagogics. NArFU’s 15 institutes currently have more than 17 000 students coming from Russia and 52 countries in South-East Asia, Europe, North and South America, CIS countries. Every year more than 400 our students join international exchange programs and undertake internships in partner universities all over the world. Foreign Language Acquisition and Teaching and others.